End-of-season reports: How did Russia’s NHL players fare in 2014-2015? Now that the NHL regular season is over, not only have the pairings for the playoffs for the main trophy of the tournament – the Stanley Cup – become clear, but so have the overall statistics and winners of individual awards. 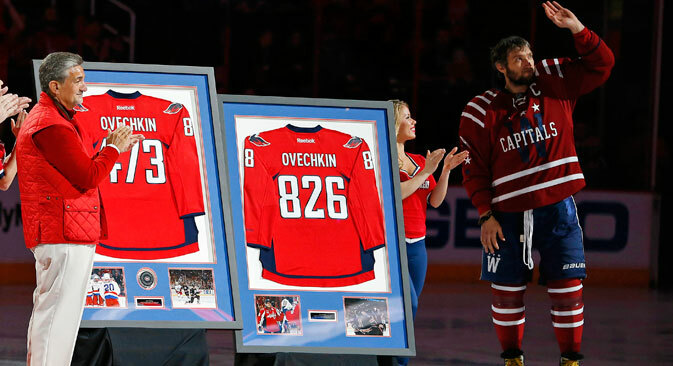 Among other achievements by Russia’s NHL stars, Alexander Ovechkin won the Maurice Richard Trophy for a fifth time, Nikita Kucherov convinced the legendary Phil Esposito of his worth, and Vladimir Tarasenko became St. Louis' key figure. RBTH gives you the lowdown on who made the difference in 2014-2015. Washington Capitals captain Alexander Ovechkin became the season’s top scorer with 53 goals. "Ovi" won the Maurice Richard Trophy for the third time in a row and became the first five-time winner of the award in NHL history. The 29-year-old Russian hockey player also repeated the records of Mario Lemieux and Ilya Kovalchuk for power-play goals, broke the Capitals records for goals and points, and led his team to the playoffs once more after last year's failure to qualify. Previously, the Russians who managed to become the best in goals in regular NHL seasons were Alexander Mogilny, Pavel Bure (three times) and Ilya Kovalchuk. Another Russian star in the NHL – 36-year-old Pavel Datsyuk – won the Lady Byng Memorial Trophy (as the player seen to be the most sportsmanlike and gentlemanly). Datsyuk saw action in 63 matches, tallying 26 goals with 59 steals and receiving only four 2-minute penalties, despite the fact that Datsyuk often faces tall, quick forwards, which makes it difficult to steal the puck without breaking the rules. In the playoffs, Datsyuk's Detroit Red Wings will face the season's most Russian team – Tampa Bay. Three Russian field players – Nikita Kucherov, Vladislav Namestnikov and Nikita Nesterov – took to the ice with the team in the course of this season, as well as two goaltenders – Yevgeny Nabokov and Andrei Vasilevsky. This season turned to be a true breakthrough for 21-year-old Kucherov: Nikita entered the top thirty of the best scorers in the league, became – along with Montreal's Max Pacioretty – the most efficient NHL player and broke all possible personal records. "I am sure that Kucherov can score 25 goals a season," legendary ex-player Phil Esposito said in early November – and, as it turned out, he had underestimated the Russian, who scored three goals more. Thirty-six-year-old Andrei Markov won a prize for sporting character and dedication to ice hockey (the Bill Masterton Memorial Trophy). This season, Montreal's defenseman missed only one game, entered the top six of the best defensemen in the league in plus-minus, scored 50 points and averaged nearly 25 minutes per game. But it was not clear just three years ago whether Markov would ever walk normally again after so many operations on his knees. The regular season also turned out to be magnificent for St. Louis forward Vladimir Tarasenko. The Russian was one of the league's top 10 scorers and the 73 points he bagged during the season made him St. Louis' highest scorer in the last 12 years. "Tarasenko is unique," said Washington's former defenseman, now the head coach of the Russian club Traktor Chelyabinsk, Andrei Nikolishin, in an interview with RBTH. The great performance of the Russian national team's goaltender Sergei Bobrovsky was unfortunately not enough to help his team, the Columbus Blue Jackets, continue the fight for the Stanley Cup in the playoffs. Bobrovsky tasted victory in 30 matches, kept a clean sheet in two matches, and achieved the fifth-best save percentage in the entire league – 91.8 percent. The last time that Bobrovsky missed the Stanley Cup was in the 2012/13 season.